This weekend I started working on tghe control system. However, mad some mistakes and had to quit. Started off by fabricating the elevator push tubes. Got them cut to length the using the template, marked the holes to be drilled for riveting the threaded rod ends. Holes were marked and drilled. I did do both tubes at the same time so that I could get them coated on the inside with Akzo primer. Made up a batch and poured inside getting them coated. Set aside to dry and will finish riveting the ends in tomorrow. Moved on to getting the jam nuts put on all rod end bearings. Then worked on the Aileron pushrods. Installed the rod end bearings in each and all jams tightened to where the pieces are to the correct length. I then started to work on the elevator idler arms and got them put together with clecos and then started to match drill. For some reason I decided to not align the holes in the flange bearing and proceeded to drill completely new holes. Once I realized this, time to stop and order a new flange bearing. This probably was not a big deal but bothered me enough to set aside until new part arrives. The pushrods then dried overnight so I installed and riveted the threade rod ends in and then got a coat of primer put on the oustide. Again set aside for a day to let dry. While they were drying I moved on to the controls sticks. Got the control stick base aligned up correctly and drilled to the control sticks. This was a bit tricky but took my time and everything worked out good. I then got the control column prepped and installed into the fuselage, bolted and torqued per specs. Next was to get the control stick bases installed to the control column but there are a couple of bronze bushings that need to be opened up enough for a AN4 Bolt. I did not have a reamer so I tried to use a 1/4 drill in a drill press to get them to the right size. This ended in complete failure and ruined the bushings. Now that I have a couple of different pieces that I screwed up on and ruined. I am stopping with this section and will finish when I get new parts from Vans. Today I started gathering all the pieces for the Rudder construction. 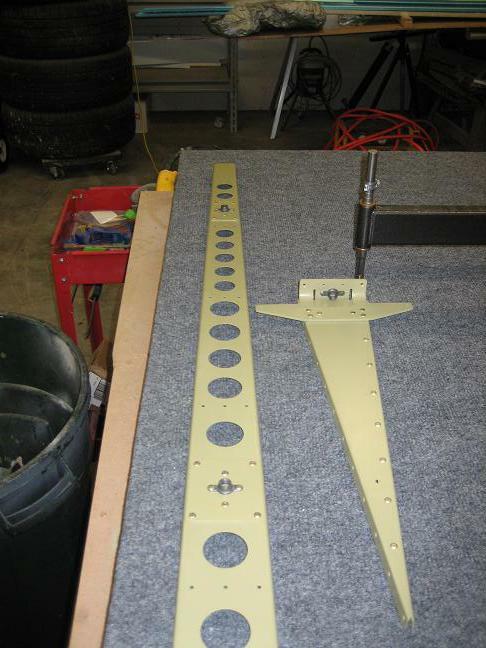 The first thing to do is cut apart the rudder stiffeners and brackets. I did this with a band saw and then ran across all the edges with the scotch brite wheel. Took all parts and deburred the edges. After that was completed took all parts and assembled per directions with cleco's. Match drilled all holes and then clecoed the skins to the skeleton. Finished match drilling the skins and the disassembled the entire rudder. I have decided to add rudder trim, am trying to find the best way to do this with some ideas from other builders. 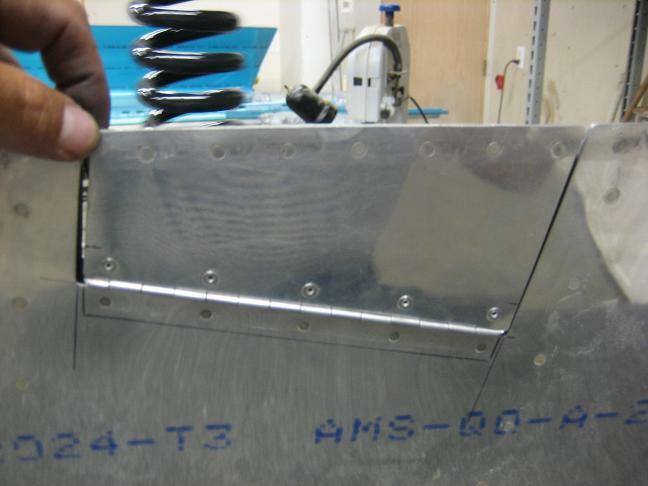 You can check the progress of that modification here - Rudder Trim. I then deburred all the holes and dimpled the skin along with all corresponding parts. Once everything was all deburred, I applied Alumiprep 33 and rinsed with water. Then applied the Alodine to all parts. Now that all parts have Alodine, I mixed up the Akzo primer and applied to all parts. Now that I am ready to start assembling, need to figure exactly how to do this rudder trim. What I am going to try is to cut out a small portion of he rudder and add a servo just as is done for the elevator trim. This rudder trim has been done by a couple of others. 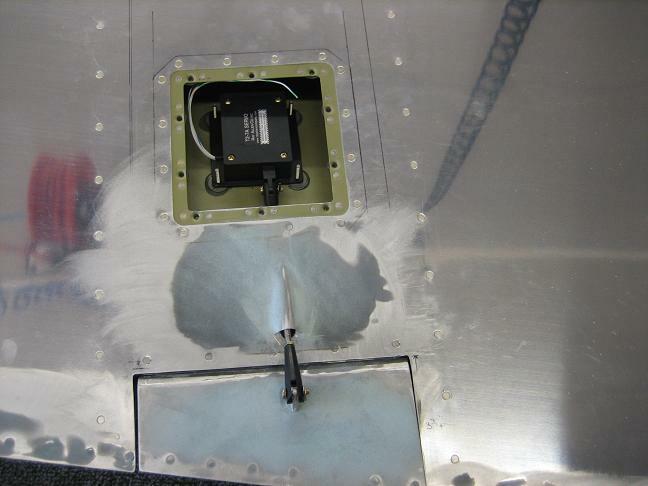 You can see all the rudder trim mods here in the building tips section. Started putting the rudder together with rivets. I was hoping to do the rudder trim as I put it together, but since the trailing edge has to be glued with Pro Seal, I decided to just finish it and then do the rudder trim. Hope I do not regret this decision. Finished riveting the spar to the skin stiffeners tonight and am ready to start putting in the rivets attaching the skin to the stiffeners. I am stressing out about putting the rivets in the trailing edge. Since there is the possibility of it hooking as you put them in, I am sure it will happen to me. I have also decided to alternate from side to side as I install the rivets. 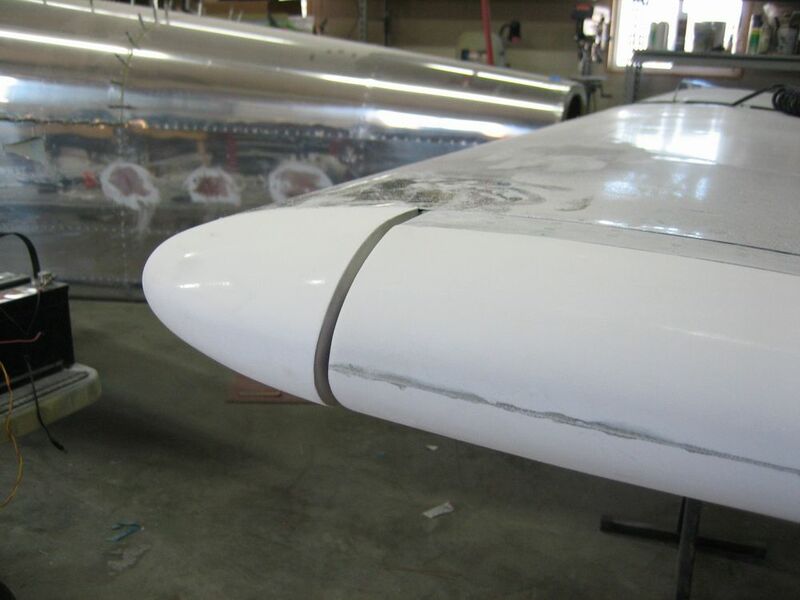 I worked on the trailing edge rivets and did exactly as the direction mentioned by starting to just barely set the rivets, doing every tenth rivet or so and then every fifth and so on till they were all in then did the same procedure when finishing them. This did turn out OK with no hook noticed. The hammered end of the rivet did fit somewhat ok in the dimple, but did not care for it. However, when checking the rivets, they all seemed to be pretty loose, in fact some fell out as I gave them a little push with a punch. Not very happy about this. I am thinking the holes got a bit reemed out when I match drilled perpendicular to the plane. So what I decided to do is remove all the rivets and replace them with Oops 426 4-3.5. This would give the same head as the 3-3.5 but with a bit bigger shank. This procedure worked out GREAT. The rivets were very snug, the heads looked perfect and the hammered edge when finished set in the dimple just perfect and filled it up completely. This turned out much better than I had expected. The only issue I have with this is that when I finished setting the rivets, I ended up with some small dents in the skin. Not bad and maybe be able to cover up, but they are still there.